Hey ladies! Have you heard about the latest product from L'oreal Paris? It's the White Perfect Total 10 Whitening Day Cream with SPF30 PA+++ that claimed it has inside out whitening and oil-control technology! With White Perfect Total 10 Day Cream Moisturizer, skin receives both deep* whitening action and protection against UV-induced darkening, including oil-control. This is possible due to its Vitamin CX Technology, a unique combination of three vitamins – C, B3 and E – known to help fight skin darkening at the epidermis level. White Perfect Total 10 Day Cream Moisturizer’s protection function guards against UV-induced skin darkening. Powered by the Advanced Shield Complex SPF30 PA+++, White Perfect Total 10 Day Cream Moisturizer protects skin from external aggression that may cause UV-induced darkening in the first place. Both technology come together to give skin inside out action and protection against UV-induced darkening, first by reducing existing dark spots and then preventing future ones from developing. It’s total whitening and oil-control care with White Perfect Total 10 Day Cream Moisturizer. 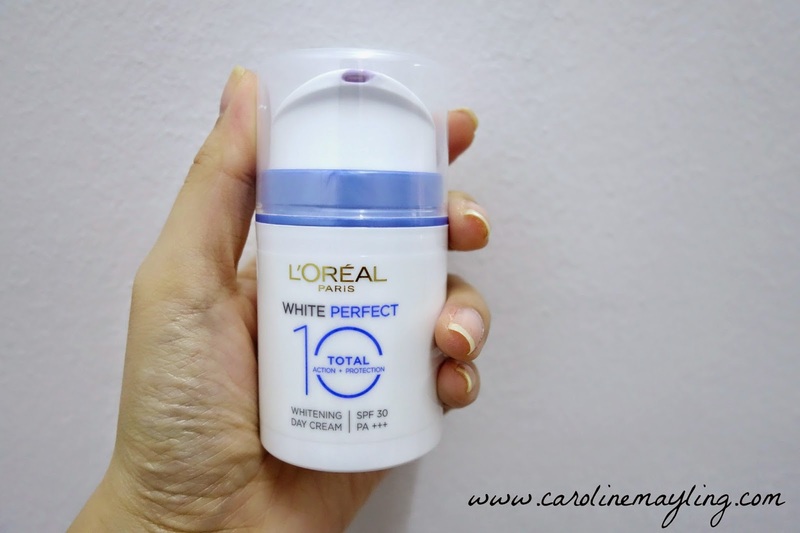 I was quite surprised that White Perfect Total 10 cream moisturizer has a light cream texture as I normally feels that moisturizers with SPF are normally tend to have thicker cream texture. It also comes in light lavender color and mild pleasant scent which will be gone after fully absorbed. I love how it easily absorbed into my skin and not only keep my skin hydrated, but also protect my skin from the sun damage. As for the oil control, it does help a little as it kept my T-zone shine-free at least for a good 5-hour. ** White Perfect Total 10 Day Cream Moisturizer is available at RM39.90 for 50ml.